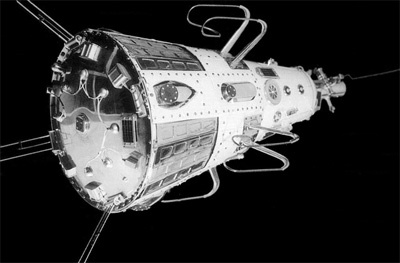 The D-1 satellite, better known as Sputnik 3 was the first complex scientific satellite. Originally planned to be the first satellite to be launched, it suffered delays and instead the simpler PS-1 became, by the name of Sputnik 1, the first satellite to orbit earth. The 1327 kg D-1 satellite consisted of a conical pressurized body and was powered by batteries for a lifetime of one month. It had no stabilisation systems. A tape recorder recorded the data and allowed playback of data from parts of the orbit beyond the range of ground stations. Scientific instruments included a magnetometer and field-mill electrometer to measure fields in space, four space radiation detectors to study cosmic and solar particle radiation, a mass spectrometer and two pressure gauges to analyze the rarified outer atmosphere, an ion trap to measure plasma, and a piezoelectric microphone to count micrometeorite strikes. Also on board was an experimental solar batterie to power one of the transmitters. The first D-1 satellite was launched on 27th April 1958, but failed to reach orbit as the launch vehicle was destroyed by an excessive pogo-effect 88 seconds into the flight. The second satellite was launched successfully on 15th May 1958 and received the name Sputnik 3. It operated for about one month.